St. Gabriel Closet opened in 2002 as a thrift shop. Adult and children’s clothing, shoes, purses, furniture, artwork, games, household items and many other things are available at very low prices. Most items are in excellent condition with some items still having the store price tags on them. 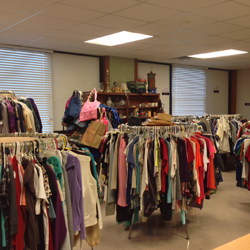 All items have been donated by generous benefactors as well as community members. The Closet is staffed entirely by volunteers. Client’s needs are assessed by a case manager. During individual sessions instructions on money management and job awareness are given. Networking with other agencies is done to provide further assistance. This process results in many families’ lives being impacted. St. Gabriel Closet accepts and appreciates new or gently used items, such as clothing, furniture, appliances, electronics and household items. St. Gabriel also shares the donations that are not sold with community shelters and church ministries with missions similar to ours. All items donated are tax deductible. Sales are offered throughout the year, including periodic “25 Cents Sale” and “$5.00 Bag Sale”. With affordable prices for essential home items, customers are encouraged to “shop till you drop”. To our donors, volunteers and the community we say “Thank You”!